Webmaster note: This blog has a long history of Loretta Sanchez related posts. I haven’t posted here in some time, but I figured that now is as good a time as ever to resume posting here periodically. So given today’s news of Congresswoman Loretta Sanchez jumping in the California Senate race, we’ll begin again. After denying reports that she would enter the race to replace Senator Barbara Boxer, Congresswoman Loretta Sanchez officially announced that she is officially running for the U.S. Senate. Sanchez becomes the second Democrat to enter the race, challenging California Attorney General Kamala Harris. Sanchez has been counting on her Latina heritage to be a factor in the race, even knocking Harris last month for not being able to speak Spanish. In recent months, there have been rumblings in the Golden State’s Latino political class about there not being a high profile Latino in the Senate race. 1. Congresswoman Sanchez has, at times, had a contentious relationship with local DREAMERs. If there’s one group of people who are consistently viewed favorable within the Latino community, it’s the undocumented youth activists, who have advocated for deportation relief in addition to more humane immigration policies. Local DREAMers have staged sit-ins in the Congresswoman’s office demanding that she come out forcefully in favor of halting deportations as the immigration reform debate has stalled. OC Weekly writer Gabriel San Roman documents an exchange the the Congresswoman had last year with the well known DREAMer Activist Erika Andiola last year in this piece. You can watch the video below where after being questioned by Andiola, Sanchez walked away. DREAMers Confront Congresswoman Loretta Sanchez, Loretta Runs from Voice Media Group on Vimeo. The Hill reported that Congresswoman Sanchez missed two key votes today because she wasn’t in Washington, D.C. One of those was an amendment to remove language from the defense bill to allow young immigrants (DREAMers) to serve in the military. The GOP led House voted to strip language from the defense bill that would have asked the secretary of defense to review policies that would have allowed qualified undocumented young adults to serve in the military. 2. Turning out Latino voters in the primary will be key for Loretta Sanchez, but this analysis from the Washington Post shows how difficult a task this has been in the past two election cycles. White voters still have the highest turnout rates in California. 3. 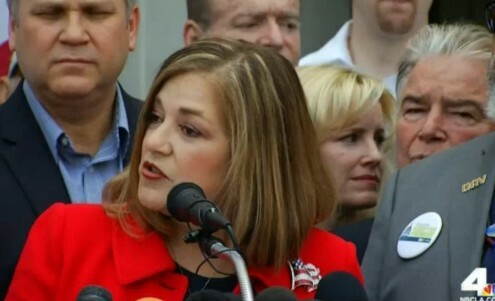 Loretta Sanchez has been instrumental in ramping up the militarization of the border. For years, Congresswoman Sanchez has been on the House Homeland Security Committee. Back in 2010, she touted passage of the 2010 Emergency Border Security Supplemental Appropriations Bill. That bill added 1,000 new border patrol agents, funded unmanned aircraft systems for surveillance at ports of entry, and provided $7 million to expand ICE jail programs. Is this kind of militarism something that Latino voters in California want?